Helen Holcombe was born in 1872.1 She was the daughter of Bradford F. Holcombe and Esther Matthews.1 Helen Holcombe died in 1873.1 She was buried at Old Holcomb Cemetery, Huntington Twp., Gallia Co., OH. Sylvester Hall was the son of Comfort Hall and Jemina Bacon. Sylvester Hall married Rosetta Johnson. Rosetta Johnson married Sylvester Hall, son of Comfort Hall and Jemina Bacon. Cheryl A. Chandler was born circa 1961. She married Benton Garrett Moore, son of Harry Claude Moore Jr. and Maurine Garrett, on 12 November 1987. Marvin Pierce was born on 17 June 1893 at Sharpsville, Mercer Co., PA.1,2 He was the son of Scott Pierce and Mabel Marvin.1 Marvin Pierce married Pauline Robinson, daughter of James Edgar Robinson and Lula Dell Flickinger, in August 1918.2 Marvin Pierce married Willa Gray Martin in June 1952. Marvin Pierce died on 17 July 1969 at Rye, Westchester Co., NY, at age 76. Marvin and Pauline were enumerated in the 1930 Rye, Westchester Co., NY, federal census. He was the assistant to the president of a publishing house, age 36, she was 33. Children in the household were Martha A. 9, James R. 8, and Barbara 4. Marvin was president of McCall Corporation, the publisher of the popular women's magazines Redbook and McCall's. Pauline Robinson was born circa 1896 at OH.1,2 She was the daughter of James Edgar Robinson and Lula Dell Flickinger.1 Pauline Robinson married Marvin Pierce, son of Scott Pierce and Mabel Marvin, in August 1918.2 Pauline Robinson died on 23 September 1949 at Rye, Westchester Co., NY; from injuries in a car accident. Scott Pierce was born on 18 January 1866 at Sharpsville, Mercer Co., PA.1 He was the son of Jonas James Pierce and Katherine Pritzl.1 Scott Pierce married Mabel Marvin, daughter of Jerome Place Marvin and Martha Anne Stokes, on 26 November 1891. Mabel Marvin was born on 4 June 1869 at Cincinnati, Hamilton Co., OH.1 She was the daughter of Jerome Place Marvin and Martha Anne Stokes. Mabel Marvin married Scott Pierce, son of Jonas James Pierce and Katherine Pritzl, on 26 November 1891. Lula Dell Flickinger was born in March 1875 at Byhalia, OH.1 She was the daughter of Jacob Marion Flickinger and Sarah Haines.1 Lula Dell Flickinger married James Edgar Robinson, son of John William Robinson Jr. and Sarah Coe, on 31 March 1895 at Marion Co., OH. Jonas and Kate were enumerated in the 1880 Sharpsville, Mercer Co., PA, federal census. He was in the iron business, age 40, she was 39. children in the household were Scott 14, James A. 12, Chloe H. 10, Jonas Jr. 5, and Fredric P. 2 months. Also in the household was mother in law Louisa Pritzl, 67, and niece Emma K. Laux 22. Jonas and Kate were enumerated in the 1900 Sharpsville, Mercer Co., PA, federal census. He was a manufacturer, age 60, she was 38. Childlren in the household were Jonas 25, and Fred 20. James Anton Pierce was born on 27 October 1867. He was the son of Jonas James Pierce and Katherine Pritzl. Chloe Pierce was born on 25 June 1869. She was the daughter of Jonas James Pierce and Katherine Pritzl. Jonas J. Pierce was born on 5 August 1874. He was the son of Jonas James Pierce and Katherine Pritzl. Frederick P. Pierce was born on 11 March 1880. He was the son of Jonas James Pierce and Katherine Pritzl. Child of Hannah (?) and John Parmelee Jr.
Elijah Messenger was born in 1758 at Simsbury, Hartford Co., CT. He was the son of Isaac Messenger and Hannah Alford. Elijah Messenger married Lucretia Matson. Elijah's grandmothers, Catherine and Experience Holcombe, were 1st cousins, once removed. He was a great-great-grandson of Thomas Holcombe, the immigrant. Lucretia Matson was born in 1763. 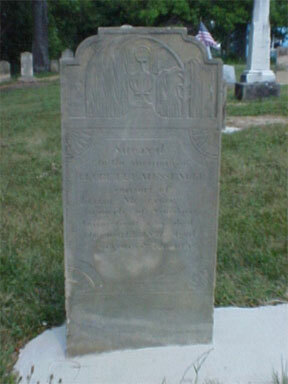 She married Elijah Messenger, son of Isaac Messenger and Hannah Alford. Lucretia Matson died on 12 August 1831. Mary Parmelee was born on 11 November 1706 at Durham, Middlesex Co., CT.1 She was the daughter of Joel Parmelee and Abigail Andrews.1 Mary Parmelee married Samuel Peck.1 Mary Parmelee died on 14 October 1781 at Wallingford, New Haven Co., CT, at age 74. Samuel Peck was born on 10 October 1704 at Wallingford, New Haven Co., CT.1 He married Mary Parmelee, daughter of Joel Parmelee and Abigail Andrews.1 Samuel Peck died on 29 May 1755 at Wallingford, New Haven Co., CT, at age 50. Samuel Marvin was born on 14 February 1743/44 at Lyme, New London Co., CT. He was the son of Nathan Marvin and Lydia Lewis.1 Samuel Marvin married Jerusha Peck, daughter of Samuel Peck and Mary Parmelee.1 Samuel Marvin died in 1773 at Lyme, New London Co., CT.
Robert Marvin was born on 12 September 1770 at Lyme, New London Co., CT. He was the son of Samuel Marvin and Jerusha Peck.1 Robert Marvin married Phebe Ford.1 Robert Marvin died in January 1842 at Hamilton Co., OH, at age 71. Phebe Ford was born on 1 August 1770 at Dover, Morris Co., NJ. She married Robert Marvin, son of Samuel Marvin and Jerusha Peck.1 Phebe Ford died on 19 July 1852 at age 81. Samuel Ross Marvin was born on 5 June 1804 at Dover, Morris Co., NJ. He was the son of Robert Marvin and Phebe Ford. Samuel Ross Marvin married Julia Ann Place.1 Samuel Ross Marvin died on 29 June 1863 at age 59. Samuel R. and Julia A. were enumerated in the 1850 Crosby, Hamilton Co., OH, federal census. He was a farmer age 46, she was 42. Children in the household were Jerome 4, and Malissa 3. Julia Ann Place was born on 23 July 1808 at Oxford, Delaware Co., OH. She married Samuel Ross Marvin, son of Robert Marvin and Phebe Ford.1 Julia Ann Place died on 4 July 1884 at age 75. Jerome Place Marvin was born on 20 February 1846 at Harrison, OH. He was the son of Samuel Ross Marvin and Julia Ann Place.1 Jerome Place Marvin married Martha Anne Stokes, daughter of Richard M. Stokes and Julia Ann Myers.1 Jerome Place Marvin died on 10 October 1917 at Harrison, Hamilton Co., OH, at age 71. Jerome P. and Martha A. were enumerated in the 1880 Harrison, Hamilton Co., OH, federal census. He was a druggist, age 34, she was 33. Children in the household were Mable 11, and Maud 9. Ethel Parks was born in 1891 at Lincoln Co., KS.1 She was the daughter of Ernest Theodore Parks and Tabitha Rash. Ethel Parks died in 1907 at AR. Naomi Parks died in 1895 at Lincoln Co., KS. She was born in 1895 at Lincoln Co., KS. She was the daughter of Ernest Theodore Parks and Tabitha Rash. Goldie Parks was born in May 1895 at Lincoln Co., KS.1 She was the daughter of Ernest Theodore Parks and Tabitha Rash. Goldie Parks died in 1981 at Fayetteville, Washington Co, AR. Louise Parks was born in September 1897 at AR.1 She was the daughter of Ernest Theodore Parks and Tabitha Rash. George Jones was born in 1913. He was the son of Harvey Jones and Goldie Parks. George Jones died in 1950.